I'm happy to say I was standing there watching it all that day. 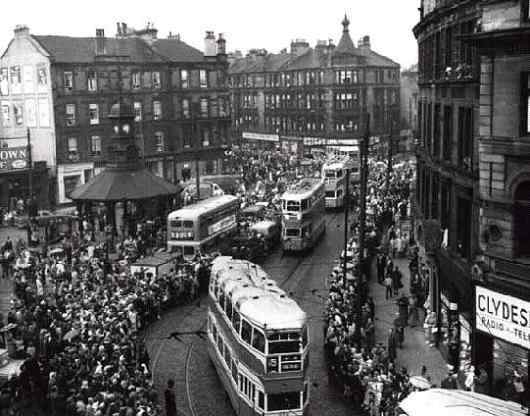 Ruby Street and the Bridgeton Tramcar Depot is the first street on the left. was erected in 1836. Sadly the church was demolished in its 150th year, in1986. Interesting to note that the first minister of this Church of Scotland church was the Rev Patrick Fairbairn. 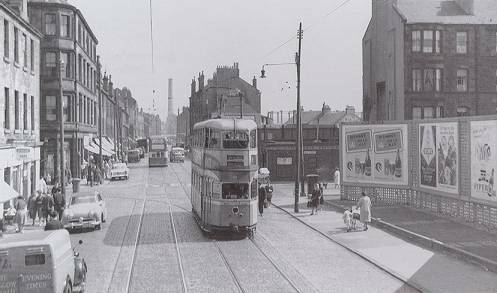 Fairbairn Street is the second street on the left as you look down Dalmarnock Road. At the very end of Dalmarnock Rd., in the picture, you can see the chimney of Dalmarnock Power Station. May 2002 Dalmarnock Road looking south from the same spot as above! 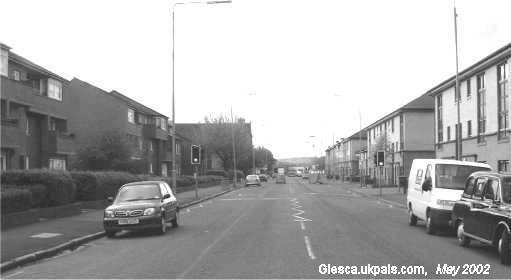 Ruby Street has gone, Dale Street is the first opening on the right at the pelican road crossing. The Church at Fairbairn Path (Street) can be seen.